According to MCA Insight the eating out market is currently valued at around £89.4bn. 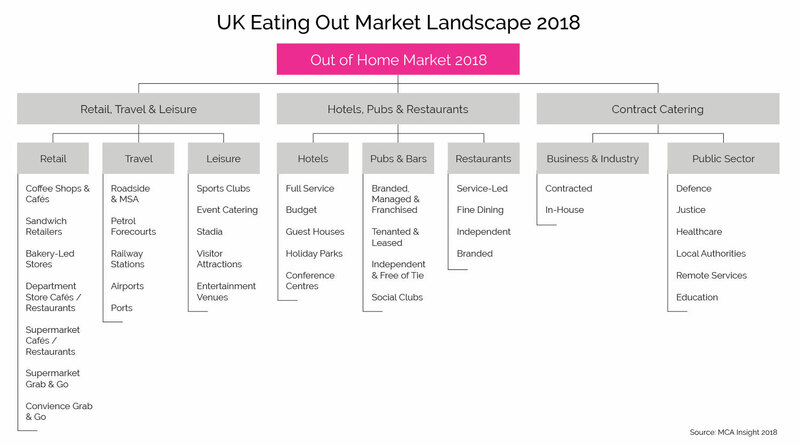 With consumer participation rates of 93.4% eating out is now part of our daily lives and represents a huge opportunity for food and drink brands. With approximately eight times as many foodservice outlets as retail and convenience stores the market is vast and equally complex (as illustrated below). Foodservice, or as it is sometimes referred to – Out of Home (OOH), Away from Home (AFH), Hospitality or even HORECA (Hotel, Restaurants & Catering) is a challenging, but equally rewarding market. As growth in the major multiples plateaus, foodservice is still growing at around 1.5% according to MCA, despite Brexit, and has become an attractive prospect for venture capitalists and investors. Now, as never before, the world of eating out and being a ‘foodie’ is as mainstream as it is aspirational, with the rise of chefs and cooking culture dominating today’s TV schedule. Not only is foodservice a great market for food and drink brands, it also offers a vital channel to help you position your brand in the right setting, while at the same time sampling consumers which can often lead to follow-on retail sales. As Fiona, our CEO, set-out in her MAA article published in The Guardian, independent research with 300 consumers showed that 76% have gone on to buy a product they have tried when eating out, so brands who don’t have a strong presence in the out of home market may want to think again. There is a perception that foodservice is too complex, too fragmented and quite simply too much hassle. When it comes to the multiples you can fit all the decision makers to cover the market comfortably into one room; with foodservice it is quite a different story. As highlighted by the market map above, the out of home market offers a wide range of sector opportunities, each with their own specific challenges. Defining focus and prioritising sectors for any food and drink brand is the first step on the path to successful food and drink marketing in foodservice. A common mistake is for brands to be pulled by the opportunities presented by the market, rather than setting out with a clear plan of action based on product fit to market and the size of the sector opportunity. Where retail benefits from the copious amount of data available, this is far from the case out of home and estimating market value in the world of foodservice is a challenge in itself. Often a whole marketing budget could be spent trying to accurately estimate the market, so brands find themselves in the difficult and often uncomfortable position of having to go with their instinct based on limited data and insight. This is often a hard sell at board level and without a clear P&L and data to back up investment, many foodservice launches fall at the first hurdle. When you do have the company’s backing there’s the crucial point of understanding your end user, and here knowledge of and insight into your customer is key. Who are you targeting? Are they a buyer, chef, F&B Manager, owner, purchasing director, development chef – the list goes on. Understanding the decision-making process and influencers within each organisation is hugely important. Are they an independent site, a disciplined multiple with buying power at head office level, an undisciplined multiple with a listing at head office but freedom of choice day to day? What challenges does their sector hold? If they are in the hotel market they might be looking for ways to keep guests on site to eat; if they are a school caterer they’ll be looking for the holy grail of cost effective, healthy meals that kids will choose to eat; if they are a casual dining group consistency is everything; while B&I contract caterers are looking for on-trend flavours and street food inspired products to help them fend off competition from the high street. The route to market for foodservice is also often perceived as a barrier and an added layer of complexity. In order to reach independent operators, you need to gain listings with wholesalers who service your target sector. There are the big national multi-temp players like Bidfood and Brakes along with the large Cash and Carry chains like Booker Makro (who also offer delivered). But under this top tier there is a whole raft of regional or specialist wholesalers, so if the big boys won’t play there is still a way to reach the market by gaining listings with these operators to secure national coverage. Here you need to understand how you can offer the wholesaler value and help them grow the category and drive margin. Indeed, margin is an important factor to consider when looking to grow your brand out of home, as the wholesaler will add a mark-up as will the operator, therefore you need to ensure your sell-in price is realistic to allow for both stages of mark-up. Of course, the product format and fit for foodservice is also critical. Foodservice operators and wholesalers want products designed to meet their needs and the needs of their customers. The right pack and case format, the right packaging, the right prep or cooking technique, the right serve and the right price point on plate will all be crucial to your marketing. Simply taking a retail product and throwing it into the foodservice market rarely works. Remember when it comes to foodservice the operator is staking their reputation on your product so it is essential it delivers. There are real commercial challenges in the market as well, be it the exchange rate impact of Brexit and food price inflation, the more discerning nature of consumers forever looking for real value for money, through to the National Living Wage, rent rises, competition in the market and retailers’ dine-in offers. Sector trends, cuisine trends, day part trends, demographic trends, you name it – foodservice marketing needs to keep on top of them all. From health (in all its forms) at one end of the scale, to indulgence at the other, convenience to customisation and premiumisation, provenance and authenticity – at any one time there will be a range of mega trends at play in the eating out market. Some food trends turn out to be a flash in the pan and burn out as quickly as they hit the headlines, others become part of the eating out landscape. Currently food to go/convenience, foodie culture and eating out technology are driving the market, whilst free-from/vegetarian menu options are also making their mark. Premium delivery channels like Uber Eats and Deliveroo are shaking up the market but also offering an additional revenue stream for forward thinking operators. This is just one part of the impact technology is having on the market. From social media to review sites, online ordering to bill paying apps and sophisticated epos systems offering diner analysis to aid menu engineering, technology is becoming more and more a part of the world of eating out and food and drink marketing. All day dining and the decline of traditional meal times is a big influence on menus as is the growth of breakfast and snacking with food to go. Whilst cuisine trends come and go, others are mainstream like Italian, Asian, Americana, etc. Insight companies like MCA Insight and The Food People make it their business to track menu trends and report on these, helping brands and operators keep on top of these trends. The influence of Korean BBQ, Hawaiian Poke, Caribbean, Peruvian, Vietnamese, Contemporary Greek, Scandinavian fayre, the move to flexitarian, vegetarian and vegan, indulgence and health (the list goes on) can all be seen coming through on menus. And as we know, consumers are more adventurous when out of home so trying new and exciting dishes and cuisines is always going to be a key dynamic in the out of home market. Food and drink marketing in foodservice is a fine art and only by understanding each sector and the dynamics therein can you begin to craft a brand positioning or a campaign which will engage with your key decision makers. Our experience of over thirty years in the market has been that integrated communications tailored to the sector work best. As technology has evolved, video, email marketing and social media offer us engaging ways to communicate key messages out to our market. Yet for some sectors there is still a place for high impact DM, and of course the role of industry titles both online and in print is hugely important. Whatever the communication channel, be it trade press, online, email, direct mail, promotions, events or social media, it all has to start with the message and the ‘so what?’ The foodservice decision maker is a tough and discerning audience. Ensuring your brand or product offers a real benefit to them and getting that message across in no uncertain terms is key. Insight in all its forms can help build a strong sell-in story, whether that is consumer insight to demonstrate demand, sales out analysis to show the category sell and demonstrate opportunities for growth, or U&A insight with your target audience to help identify what key product features they really value. Creating a strong foundation based on insight, layering on strategy informed by market expertise and experience, and executing with stand-out creative – that’s the secret to strong foodservice marketing. The right team, the right angle, the right channels and there you have it, the recipe for success in the challenging market of foodservice. You can see some examples in our portfolio here some of which are award winning! Well, with thirty years’ experience, a truly integrated approach and a great team we know our stuff (as you can hopefully see from this article). But don’t take our word for it, here’s what others say about us. Interested? Why not get in touch today? NB: Please note all statistics are correct at the time of publishing July 2017. However, as the foodservice market is a dynamic one they are likely to change over time.